House Clearance Service In All Areas Ackworth Alverthorpe Castleford Crigglestone Crofton Durkar Fairburn Ings Featherstone Ferrybridge Walton West Bretton. 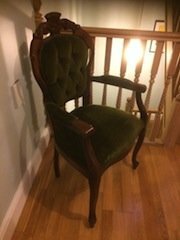 A vintage style mahogany carved back hall chair, upholstered to the seat, armrests and backrest in green velour. 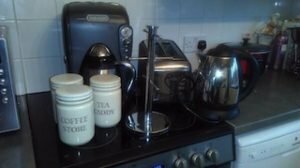 A small collection of kitchen accessories, to include a Delonghi bread maker, a two slice toaster, two kettles, a cup holder and tea, coffee and sugar canisters. 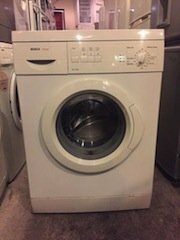 A Bosch Classixx 1000rpm 6kg under counter washing machine. 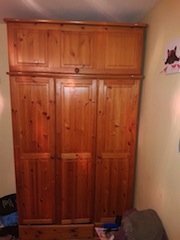 A tall standing solid pine triple wardrobe, having a double wardrobe aside a single wardrobe with shelves inside, with above storage space. 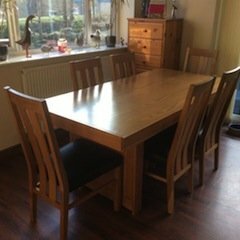 A solid oak rectangular dining table, together with six matching high back dining chairs, each upholstered to the seat in faux leather. 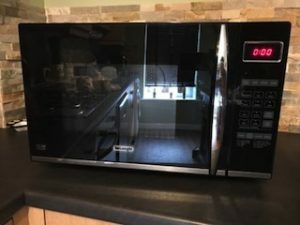 A black Delonghi 900w 20L microwave oven. 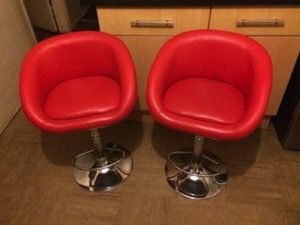 A pair of chrome based swivel breakfast bar stools, upholstered to the seats in red faux leather. 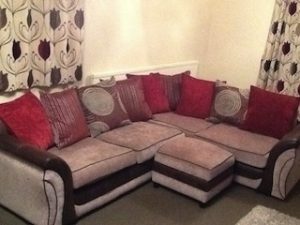 A four seater low back corner sofa and matching footstool, upholstered in chocolate brown faux leather and cream fabric. 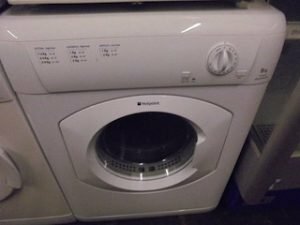 A white Hotpoint 6kg under counter vented tumble dryer. 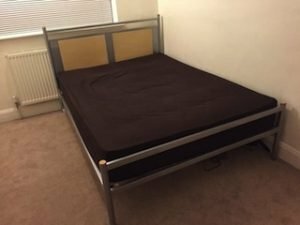 A metal and pine double bed frame, together with a double mattress. 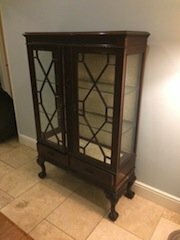 A mahogany and glass display cabinet on carved legs, having two glass shelves inside. 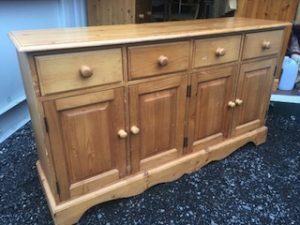 A large solid pine buffet sideboard, having four drawers above two double cupboards. 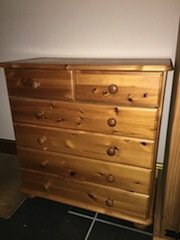 A large solid pine chest of drawers on ball feet, having two small over four large drawers. 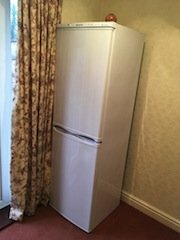 A white tall standing Hotpoint fridge freezer. 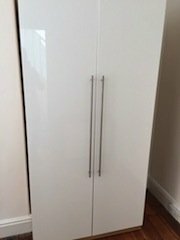 A tall standing high gloss white double wardrobe, with chrome handles. A pair of black solid wood high back dining chairs, upholstered to the seats in black fabric.